Please contact James Lindsay at mukinduri@bigfoot.com for more information. Hsiao Li's book "Bold Plum: with the Guerrillas in China's War against Japan" has now been published by the Lulu Press. Bold Plum: click here for more information or visit www.boldplum.com or the Lulu Press website www.lulu.com. HsiaoLiSynopsisweb.htm Read a summary of Hsiao Li's story of her time in the Jinchaji anti-Japanese guerrilla area and at the Yenan Communist headquarters in the 1940s. 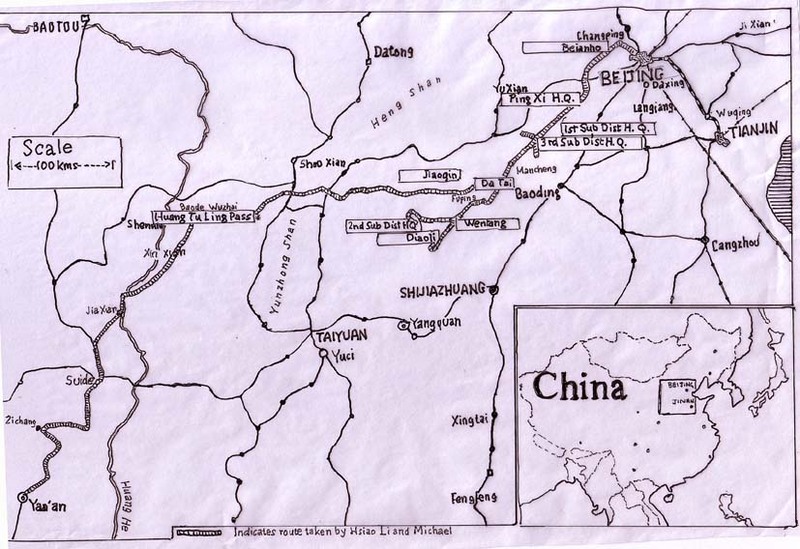 Map of area where story takes place The route which Hsiao Li and Michael took on their two and a halfyear journey (December 1941-May 1944) to Yenan is shown in red. Some of the smaller places mentioned in the text which are not marked on the underlying map have been inserted in red type. The scale is shown on the upper left hand side of the map. The file size of this map is 450k. See a pen and ink map as above File size is 100k. 7llmother.JPG Hsiao Li's mother seated in a formal pose. 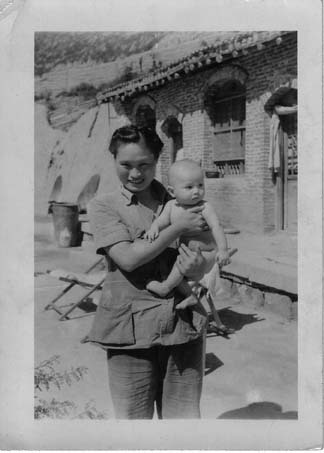 Photo was taken in Beijing in 1947. 7llfather.JPG Hsiao Li's father seated in a formal pose. Photo was taken in Beijing in 1947. 7lixiaominLLbrotherR.JPG Hsiao Li's brother was one of the first Chinese to study at Harvard University in the USA. He obtained a scholarship to one of the best universities in China. Dress was rather formal. Photo shows Li Xiaomin (standing) with a classmate. 7llstudyyenjing.JPG This photo shows Michael's study in a wing of the President's house at Yenching University. 7llhairperm.JPG Hsiao Li in corridor outside Lin Huxuan, the name of the house of the President of Yenching University. A tailor made the cotton dress, probably after she got engaged, because only then did she perm her hair for the first time. weddingfather.JPG Wedding Photo, Hsiao Li with father. 7riverbasket.JPGCrossing the Yongding River on journey from Western hills near Beijing to Pingxi. A villager, Brother Zhang paddled the party across the freezing river in a big willow basket usually used for carrying grain. December 1941. Brother Zhang faced death by a bullet to the head if the Japanese discovered that he had helped the party. 7lyaddresscrowd.JPG Michael address a crowd at a meeting in the liberated area. At these meetings soldiers and others involved in the anti Japanese war effort would talk about their activities. They showed a level political sophistication, which belied the idea that county peasants had no interest in such matters. Meetings were well attended as the crowd in this photo so evidently shows. 7ericamichael.JPGMichael and Hsiao Li holding Erica in Chenjiagou shortly after she was born. The building in the background was where Hsiao Li lived and where Erica was born. 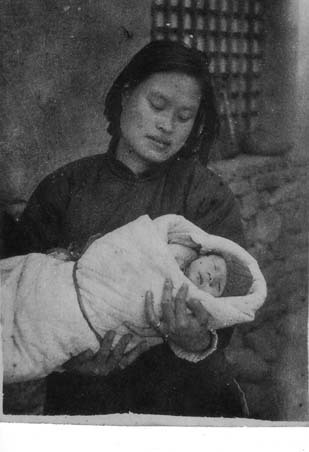 7ericachenjiagou.JPG Hsiao Li holding Erica in the remote village of Chenjiagou shortly after she was born. 7michaelerica.JPGWork prevented Michael being present when his first child was born, but he was able to visit for the first time some three weeks later. The photo shows him holding baby Erica. llradio.JPGHsiao Li watches local troops communicate by radio. In the centre is the head of the local radio department The sets were designed and built by Michael using whatever parts were available. Ji Jian district, Central Hubei province. llrockypath.JPGHsiao Li with travel companions on a mountain trail. llstanding.JPG Hsiao Li in her padded military uniform poses with General Wang Zheng (left) the commissar of the Third District of Jinchaji..
llly2other.JPG Hsiao Li and Michael pose with Dr Zang (centre left) the head of the Bethune Medical Centre and his deputy. Jinchaji Border Region. 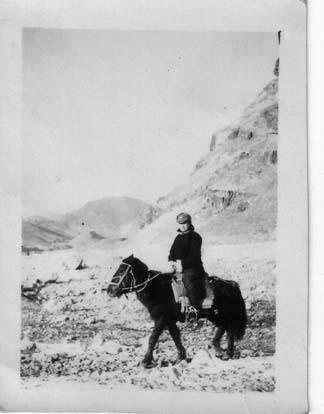 llhorsew.jpg Hsiao Li on horse. This photo was taken in Pingxi district shortly after fleeing Beijing. 7yellowxing.JPGCrossing the Yellow River on the way to Yenan, from the district headquarters of Lu Shencao. It took 6 days to reach this point. The Yellow River was one of the major physical barriers on the journey. 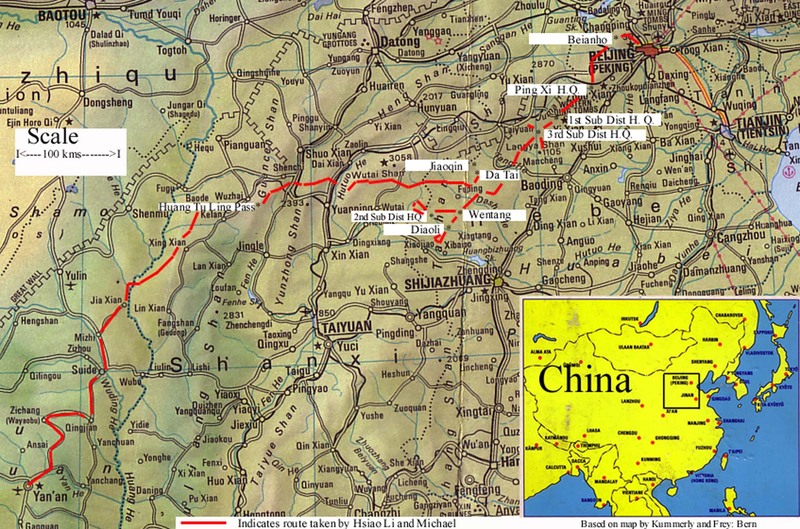 7enrouteyenan1.JPG The journey to Yenan involved the crossing of several mountain ranges. The column of people on the narrow can be seen in the lower left hand corner of the photo. 7enrtyenan2.JPG En route to Yenan. The column of troops climbing the snowy hillside seems to stretch on forever. 7enrtyenan3.JPG Troops of company commander Li up ahead. Lindsay party bring up rear. Hsiao Li is last in photo. In front of her is nurse Zhuang Suhuan, ahead of her is Lung Gu carrying Erica. "boy" Song Weimin is ahead. 7truckmud.JPG The final few miles of the journey to Yenan were made by truck. In practice it was little quicker than walking because the state of the road was so poor. 7dengxpllly.JPG Deng Xiaoping (partly obscured, second row) who was to become the leader of China following the death of Mao Zedong. Front row right hand side Hsiao Li and Michael, bottom left corner Kang Sheng, the head of the feared secret police, next to Deng Xioping is Liu Bocheng (with cap), Deng's very close colleague. Hsiao Li said she never noticed Deng Xiaoping in Yenan which suggests he had a low profile. 7llplaneyenan.JPG Contact between the American Observer Mission in Yenan and the headquarters of the American mission in Chungking was by US military plane. Sometimes the plane would bring small luxuries (such as sweets for Erica) which were unavailable in Yenan. 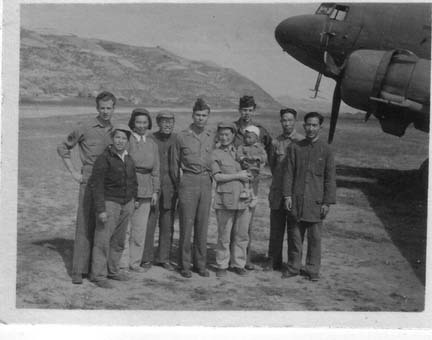 From left to right co-pilot Coy, Tang Liang interpreter, Jin Cheng, manager of the guest house where Hsiao Li and Michael were living, Pilot Champion, Hsiao Li, radio operator, 2 secretaries from the guest house. maobarrett.JPGMao Zedong with the head of the US Observer Mission to Yenan, Colonel Barrett at the function to celebrate Barrett's promotion to full colonel. Hsiao Li's granddaughter Susan, son James and granddaughter-in-law Sally visited some of the places in the guerrilla areas where Hsiao Li and Michael spent much of 1942 and 1943 including the remote village in the Fairy Mountains where Erica was born. Click here Sixty years on to see some of the pictures of that trip in September 2003.